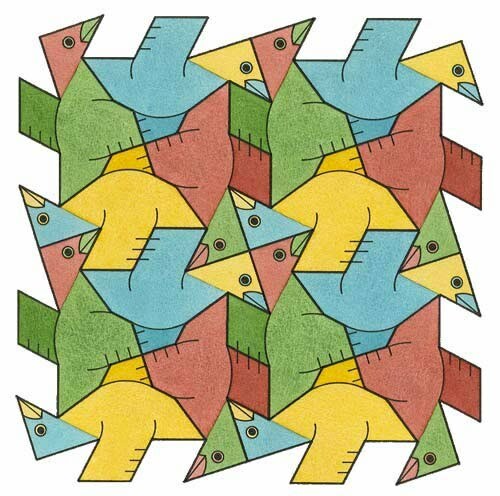 Birds 2 consist of 'finished' birds, of one motif, formed by the process of subdividing a square tile. This composition, in terms of both its colouration and of motifs is somewhat more involved than any orthodox example. 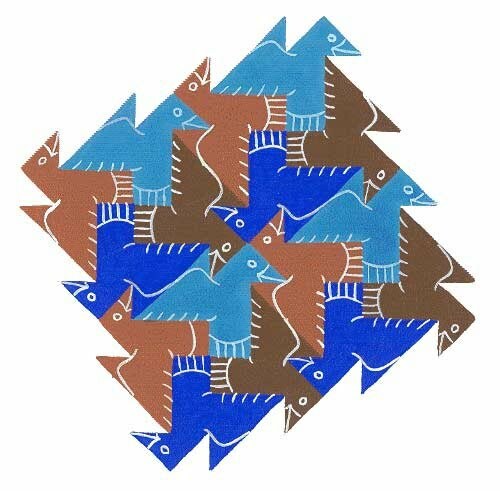 Different viewpoints of the birds are combined to showing an example of ‘under' and ‘over' views of a bird motif. Although three colours would suffice, four are used so as to be compatible with the four orientations of the motif. Additionally, this shows a somewhat secondly 'fanciful' colouration scheme, whereby with the motif shown in four orientations each orientation thus has its own core colour as regards the body, beak, tail and wings. 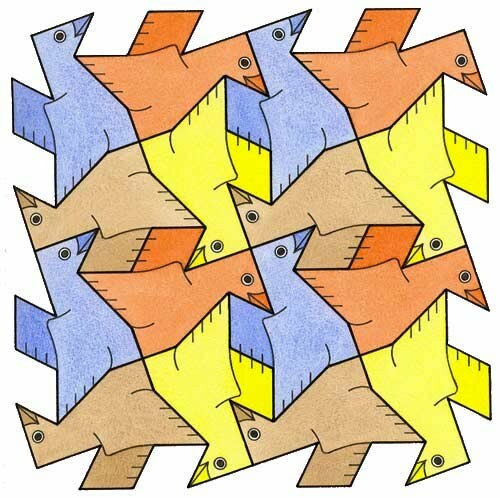 Furthermore, for the sake of variety, each bird is given a hood of the colour that is 180° to it, whilst remaining consistent with the symmetry of the tessellation. However, the differently coloured 'hood' hence results in a composition that is arguably 'unclear' as regards the discerning of the bird motif i.e. the motif is not readily definable 'at-a-glance' and so as regards its definition of motif, it can arguably be assessed as ‘borderline' in this matter as due to its 'hotchpotch' nature. Again, a bird motif that I regard to be of the highest quality. An aspect of this that differs from the preceding six examples is that the ‘viewpoint' is different, as previously the birds had their wings in an outstretched position, whereby the bird motif outline took the form of a cross, albeit to lesser or greater degrees of resemblance. In contrast, this example has both its wings in an ‘up' orientation, although there is nothing significant in this per se. Although three colours would have sufficed, such a colouration would be 'inelegant' as according to the demands of the composition's symmetry, this possessing order 4 rotation. Consequently, to emphasise the four orientations of the motif, four colours are thus used. Most of note here concerns the colouring scheme, of a more restrictive type, whereby a basic two colours of blue and brown are chosen, these essentially being of a contrasting nature. To this is added a light and dark version of each colour, thereby resulting in four colours for all four orientations of the motif.